Watch the above video to watch Tyler, the Creator get a “nod of approval” from Hans Zimmer in the newest clip from his forthcoming film, Cherry Bomb: The Documentary. With a release date of Jan. 30, Cherry Bomb chronicles the 2015 making of Tyler’s album of the same name. Cherry Bomb the album received generally positive reviews, and featured notable artists such as Kanye West, Schoolboy Q, Lil Wayne and Pharrell Williams. In the clip, we see Tyler at Hans Zimmer’s studio for the strings recording for the song “2Seater.” Zimmer gives an awe-struck Tyler a tour of the extensive studio, and nods in approval of the strings recording. The documentary will be available for limited release (sadly only 500 copies, though they will all be signed by Tyler) via the Illegal Civilization website. 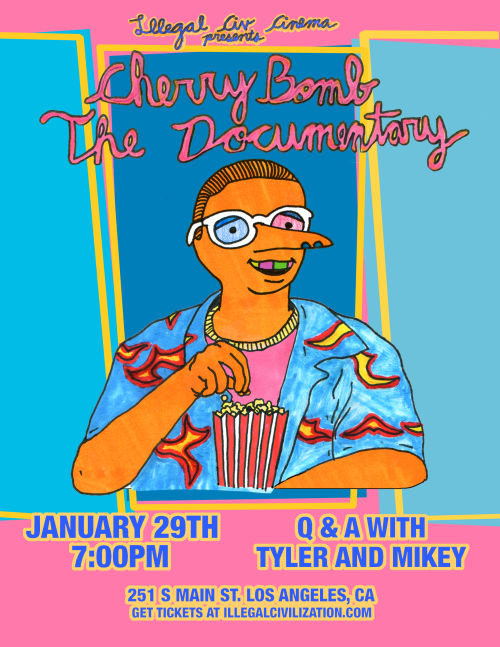 There will also be a special L.A. premieer on Jan. 29, which will include a Q&A session with Tyler and film director Mikey Alfred—see below for the flyer and the official film trailer.